The Ant & Mike Show - "We Do More Than Gossip": A Picture's Worth a Thousand Words... or $62,500!!! A Picture's Worth a Thousand Words... or $62,500!!! One of the first photographs in existence sold for $62,500 at Sotheby's auction house in New York. 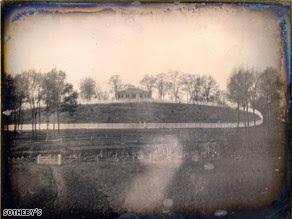 The photo that depicts a New York country estate, now known as Broadway, is a 5.5-by-4-inch, black and white daguerreotype. A daguerreotype is an image that is directly exposed to a polished surface of silver with a coating of silver halide and particles deposited by vapor, giving it a reflective finish. I can only image what this picture will be worth in 20 years. I am sure whoever purchased this photo actually made a killing by getting it for roughly $62,000. Makes me want to snap a couple pictures, lol.